The SRS is virtually maintenancefree and there are no parts you can safely service by yourself. If the SRS air bag warning light does not illuminate when the ignition switch is in the ON position, or continuously remains on, have your vehicle immediately inspected by an authorized HYUNDAI dealer. Do not attempt to modify or disconnect the SRS components or wiring, including the addition of any kind of badges to the pad covers or modifications to the body structure. Do not place objects over or near the air bag modules on the steering wheel, instrument panel, or the front passenger's panel above the glove box. Clean the air bag pad covers with a soft cloth moistened with plain water. Solvents or cleaners could adversely affect the air bag covers and proper deployment of the system. We recommend that inflated air bags be replaced by an authorized HYUNDAI dealer. If components of the air bag system must be discarded, or if the vehicle must be scrapped, certain safety precautions must be observed. Consult an authorized HYUNDAI dealer for the necessary information. Failure to follow these precautions could increase the risk of personal injury. Passengers should not move out of or change seats while the vehicle is moving. A passenger who is not wearing a seat belt during a crash or emergency stop can be thrown against the inside of the vehicle, against other occupants, or be ejected from the vehicle. Do not use any accessories on seat belts. Do not modify the front seats. Do not place items under the front seats. Do not cause impact to the doors. 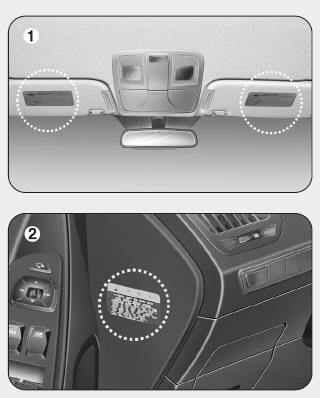 Impact to the doors when the ignition switch is in the ON position may cause the air bags to inflate. If you require modification to your vehicle to accommodate a disability, contact the HYUNDAI Customer Connect Center at 1-877- 378-8727. Air bag warning labels, required by the U.S. National Highway Traffic Safety Administration (NHTSA), are attached to alert the driver and passengers of potential risks of the air bag system. Be sure to read all of the information about the air bags that are installed on your vehicle in this Owners Manual.